From 29 June to 1 July 2016 we will be exhibiting at the 1ères Journées de Neurophysiologie Clinique (JNC) of the Societe de Neurophysiologie Clinique de Langue Francaise (SNCLF). From 14 to 17 October 2015 we will be exhibiting at the German Pain Congress 2015 in Mannheim. From 04 to 07 October 2015 we will be exhibiting at the ESICM LIVES 2015, the 28th annual congress of the European Society of Intensive Care Medicine. From 29 to 31 January 2015 we will be exhibiting at the workshop Neuro Intensive Care - ANIM 2015 in Berlin. From 04 to 07 March 2015 we will be exhibiting at a congress for pain and palliative care in Frankfurt am Main. From 3 to 5 December 2014 we will be exhibiting at the 14th Congress of the German Interdisciplinary Association for Intensive and Emergency Medicine in Hamburg. You will be able to see the Dolosys Paintracker here and find out all the relevant information. We would be very pleased if you visited us at our stand. On 28 August 2014 our company won the €3000 founder's prize awarded by the Berliner Sparkasse. The prize was awarded in recognition of our successful science and technology transfer from the university environment. The prize is awarded each year by the Berliner Sparkasse together with the Netzwerk Unternehmertum of the Freie Universität Berlin (FU) in a range of issues of interest to spin-offs from the environment of the Freie Universität Berlin. On 18 and 19 September 2014 we will be exhibiting at the Capital City Congress of the DGAI on Anaesthesiology and Intensive Care Medicine. You will be able to see the Dolosys Paintracker here and find out all the relevant information. We would be very pleased if you visited us at our stand. Berlin, 15 May 2013: Dolosys GmbH has successfully completed its first round of financing. In High-Tech Gründerfonds (HTGF) und m2f investment Ltd. we have attracted two strong investment partners with outstanding sector expertise. "HTGF and m2f investment Ltd. are our ideal partners who will help us not only with financing but also with their experience in this sector and their network," said Managing Director Priv.-Doz. Dr med. Jan Baars. The financing in the mid six-figure range will be used by Dolosys GmbH primarily to develop the series device and subsequent product certification. Frankfurt, 18 June 2012: After Dolosys was named as one of the best teams in the 2nd round (business plan phase) of the Science4Life Venture Cup in 2012, we were able to present our business plan to a high-calibre jury in Frankfurt at the central office of the Deutsche Bundesbank and were subsequently awarded 4th place in the overall competition. 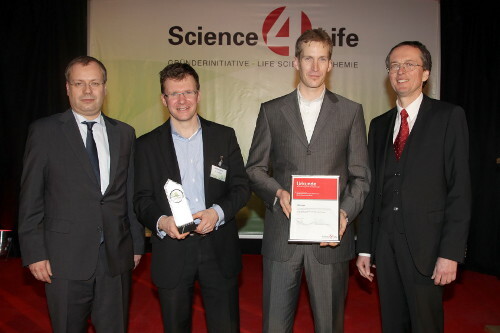 On the same evening as part of a formal ceremony we were awarded the certificate and the prize money of €3000 by the Minister of Economics for the state of Hesse, Mr Florian Rentsch, and the general manager of research and development of Sanofi Aventis, Professor Jochen Maas. Berlin, 1 June 2012 After successfully completing phase I of the EXIST research transfer funding by providing evidence of the practical feasibility of the technique in 140 patients, converting the laboratory setup to a compact prototype device and providing evidence of the economic viability of the concept, Dolosys was able once again to convince the expert jury and will also receive phase II funding in the EXIST research transfer. Thus, finalisation of the development and preparation for market launch in 2013 is assured. 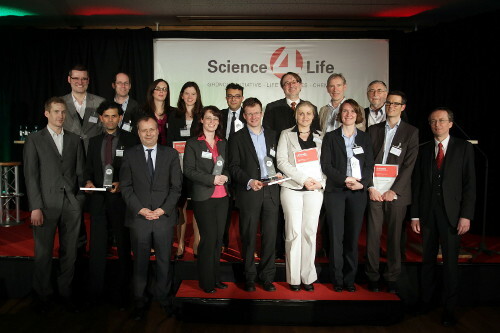 Berlin, 16 March 2012: Dolosys GmbH has impressed the German Science4Life business plan competition with its business concept. Of 87 participants, our concept was chosen and awarded by the jury from amongst the 10 best. Along with a great deal of positive feedback, we are also pleased to receive the financial prize of €1000.